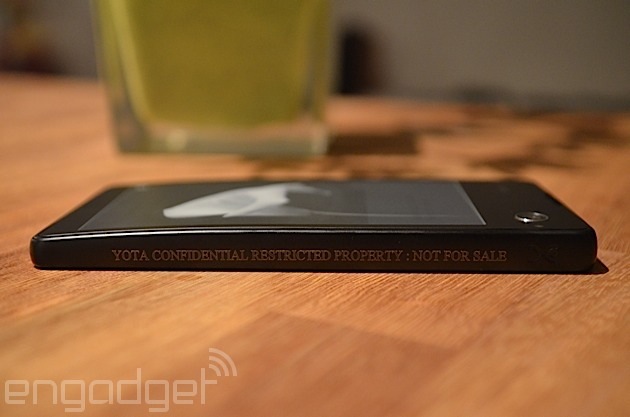 There was a moment, back in 2012, when we had some quiet doubts about the YotaPhone. The first prototype was desirable, useful, and far beyond any kind of gimmick -- but it also seemed like it'd be hard to manufacture for a reasonable price, especially by a company that has never built a phone before. After all, this is effectively two devices rolled into one: an LTE Android phone with a 4.3-inch LCD display on one side, plus an e-reader on the other side, offering always-on notifications from the OS and the luxury of over 60 hours of e-book reading time thanks to good old E Ink technology. Fortunately for us, and for any other phone lover on this planet who appreciates fresh ideas, such fears were unfounded. The Russian engineers at Yota Devices have overcome the many technical challenges that stood in their way, and the fruit of their efforts will go on sale in Europe later today via a dedicated online store, priced at a not-so-wacky 499 euros ($675). Admittedly, that may seem like a lot to ask if you focus solely on the specs -- like the 720p resolution of the LCD or the mid-range Snapdragon S4 Pro processor -- but it starts to make sense when you take a look at just how unique this thing is. And now that we're holding the final hardware in our hands, we're able to do just that. The first thing you notice when you pick up the YotaPhone is that it's more chunky than you might expect given the relatively modest 4.3-inch screen size -- but not to the point of being inconvenient or uncomfortable. The extra display certainly contributes to the phone's 146 gram weight, wide bezels and 9.9mm thickness, but this is partly off-set by the unusual curvature of the E Ink display, which allows the device to taper inwards slightly at the top and succeeds in reducing the phone's blocky feel. There are no removable covers here. The soft-feel matte plastic casing permits no entry except through the SIM tray on the top right-side corner (right-side if you're looking the LCD display, that is) -- and this tray also cleverly doubles up as the power button. Then there's the 3.5mm headphone jack on the top left and the microUSB port on the bottom. The seams around each Gorilla Glass-protected display are much, much improved compared to the prototype we saw last year, and overall the device feels sturdy. Turn the device on and you'll notice that both displays are of decent quality. 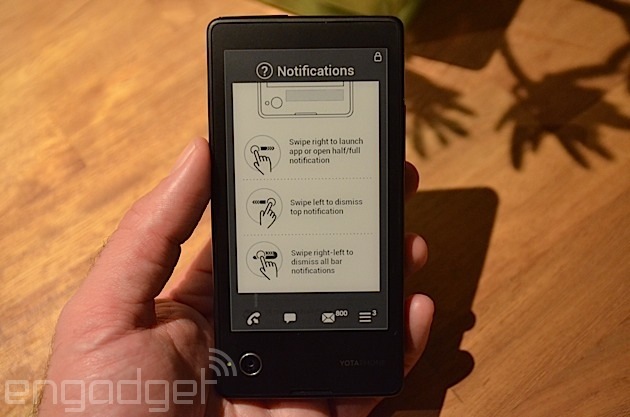 Neither one will blow you away, but the LCD side has decent viewing angles and the E Ink side has acceptable contrast. Somehow, the phone's designers have managed to dissipate the heat from the Snapdragon processor so that it doesn't disturb the fussy E Ink particles -- a system, we're told, that is now patent-protected. "Log in with a Google account and it'll take you seconds to figure out how to throw tomorrow's appointments over to the always-on display." The phone provides a brief but effective tutorial, covering basic navigation and how to flip information over to the E Ink side. Navigation is done by means of swipes on the large blank capacitive area below each display, which takes some learning but has the advantage of providing a single paradigm for gestures so that they work in broadly similar ways regardless of which side of the phone you happen to be using. Flipping info to the rear screen is done by means of a button on the top right corner of customized apps, a few of which come pre-loaded on the phone -- including a social feed aggregator, a notepad and a calendar. Log in with a Google account and it'll take you seconds to figure out how to throw tomorrow's appointments over to the always-on display -- something that is just as cool as it sounds. There's also meant to be a way to get Google Now cards on the back, but we haven't figured that out just yet. At this point we need to burrow deeper into the phone and test its usability over a good few days, so we're going to hold off on further impressions pending our full review. That said, everything we've seen so far is extremely encouraging. We're also not too perturbed by the $675 price tag. 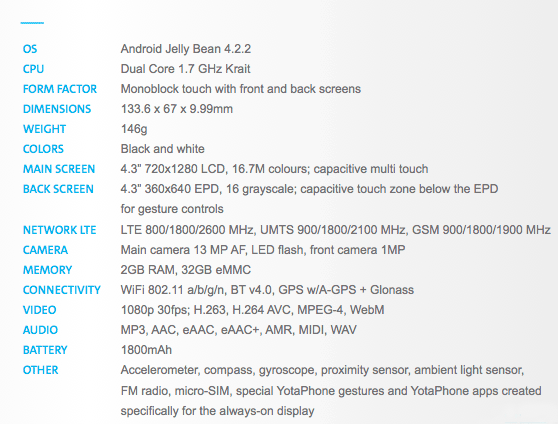 When we asked Yota Device's CEO, Vlad Martynov, about the YotaPhone's value compared to something like the Nexus 5, he gave us an answer that makes a lot of sense: around 20 percent of the price is due to the extra display and all its knock-on effects (such as the need for nine antennas to avoid interference with the E Ink particles), and perhaps another 20 percent (as a rough guess) is due to the fact that Yota doesn't yet have enough clout to negotiate bargain prices for components from the likes of Qualcomm. In other words, these costs are inevitable in this first version of the YotaPhone, and it's just a question of whether enough people will be prepared to pay that sort of money to be part of the journey from the beginning. If they aren't, Martynov says he's already preparing to offer better value in the second-gen -- but maybe we're getting ahead of ourselves. Stay tuned for our full review coming soon!